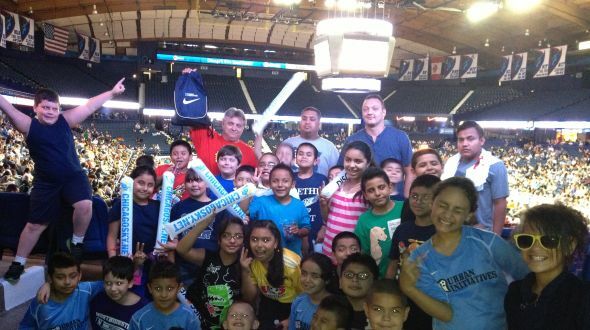 Forty children and parents from Goethe Elementary School were treated to a thrilling evening of basketball on September 11th when the Chicago Sky welcomed the Phoenix Mercury to town. Families were filled with excitement from the moment they entered Allstate Arena, until the final buzzer sounded. The children were so focused on the game that only the occasional wave and t-shirt throw from the team mascot “Sky Guy” could not break their concentration. Although the Sky found themselves trailing a large portion of the game, they did not disappoint in the end. Just as the Sky never gave up hope, the children continued to stay positive and cheer on the home town team as loudly as they could. The team and fans alike were vindicated in the end when Chicago Sky superstar Elena Delle Donne sank a buzzer beater to lift the team to victory, sending the kids of Goethe Elementary School into a euphoria that lasted throughout the bus ride home! The Sky not only provided Goethe Elementary School a great game to watch, it also opened their eyes to a different side of athletics. A majority of the children had never witnessed a basketball game. Even more importantly, the children told staff that they had never had the opportunity to watch a women’s athletic event. Many of the kids commented on their new found respect for women’s athletics, and that they had so much fun they were going to beg their families to bring them back. Urban Initiatives would like to thank the Chicago Sky and Joanna Cermak on an amazing evening. We would also like to thank all the coaches, parents, and siblings that helped chaperone the event and make sure the evening was as enjoyable for the children as possible. If any of the children were hesitant when asked to name their favorite WNBA team before the event, I think it is safe to say they all now have their answer. Go Chicago Sky!